According to the recent survey of a large audit firm, 88% of Swiss companies faced a cyberattack during the past 12 months, against 54 % of the previous year. In around two thirds of cases, hacking has caused an interruption of business activities. And a third of the companies surveyed had confidential data, of clients or partners, stolen. Despite these relatively alarming figures, 36% of companies still do not have a crisis plan. It would seem, however, that gradually there is more awareness, since 61% of CEOs are concerned about cyber risk. This concern is even more relevant because there are important implications in relation to the executives’ liability (as it was the case for Equifax in the United States). A study carried out by GFS-Zurich in September 2017 with 300 Swiss SMEs suggests that 23,000 companies (4% of the Swiss companies) have been exposed to blackmail and 290,000 companies (36%) were faced with malware. In addition, 62 percent of people surveyed considered the interruption of their IT services as very important to their business. 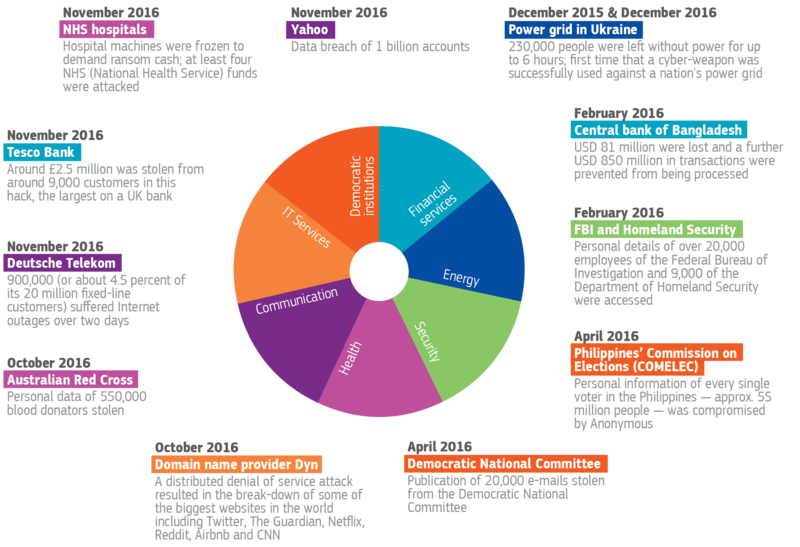 Many cases of cyber-attacks have hit the headlines. This has lead today all the companies to invest more and more significantly in their cybersecurity policy, whether in relation to business processes, through different technology media, or to management. The problems related to social engineering have lead companies to increase their prevention and internal controls, to implement protocols and training, a cautious management of rights on computer systems, etc. The transfer of all these risks to insurers sometimes takes place within the framework of a comprehensive approach to risk management, whether in relation to fidelity insurance or Cyber insurance. Although this is less often the case for SMEs. The current trend however, seems a greater awareness of all the players. But what do insurers offer within the Cyber insurance? Data recovery fees (by third-party companies, who re/enter data that exists only on paper, and restore or refurbish damaged software). On the other hand, it seems useful to integrate coverage of operating losses, when insurers are willing to do it, in order to be protected from the financial consequences of an interruption of IT systems (production and /or inventory and purchases management, etc.). Indeed, traditional operating loss insurance in principle excludes cyber risk. However, these solutions are not always available. 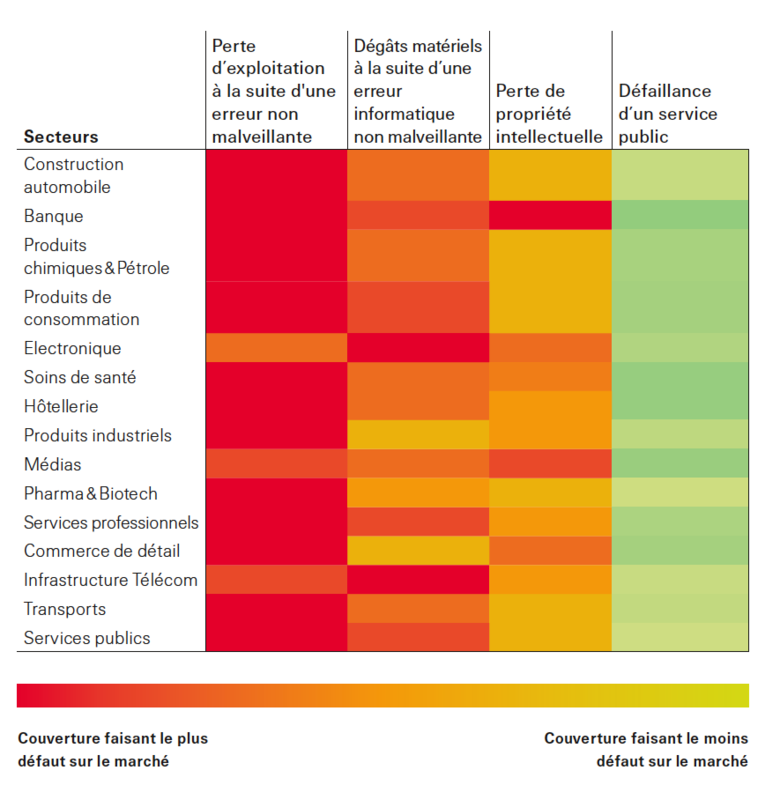 According to SwissRé data (opposite), it is harder to get this type of coverage for businesses in certain sectors of activity. But in practice, insurers seem more inclined to grant extended guarantees, in response to a need that is constantly increasing with the upsurge of cyber risk. Since corporate financial protection is a central aspect of Cyber insurance, the coverage of “cyber extortion” also became an important element, given the proliferation of ransomware on the net. This fact alone should already lead businesses to protect themselves more, because even an attempted extortion can cause insurable costs. At the same time, some insurers also offer to allocate bonuses to people who have information which may stop hackers, through dedicated coverage and subject to certain conditions. The fight against the proliferation of Internet crime has actually become a priority for insurers, along with the initiatives of some public and institutional players (project of creation of a Swiss DARPA linked to the army, Center for digital trust at the EPFL, etc.). Finally, it is also necessary to cover losses suffered by third parties, since civil liability contracts tend to exclude it. Corporate liability may be indeed affected by the violation of the confidentiality of data, as a result of breaches of security of the IT systems. For this reason, Cyber insurance in principle includes a civil liability component, often supplemented by a so-called “Media” civil liability coverage: In this case, this simply protects against various risks incurred by the insured for the use of their website (defamation, false statements, violation of copyrights, plagiarism, misuse of information, etc.). In the event of violation of the confidentiality of client data, companies must comply with their reporting obligations, and it can even happen that penalties be imposed against companies victims of hacking. Some jurisdictions allow civil fines (which is not the case in Switzerland), and the penalties imposed by the administrative authorities are therefore insurable in theory for businesses also operating abroad (except for the criminal fines). * The General Data Protection Regulation, which will come into effect on 25 May 2018, also applies to Swiss companies with clients domiciled in the EU, and provides for fines of a very significant amount (up to EUR 20 million and 4% of the turnover). However, the enforcement of such penalties could face legal obstacles, and the administrative authorities may stick to coercive measures. In conclusion, it may be recalled that other forms of cyber-extortion insurance exist, such as those in the context of Kidnap & Ransom guarantees, for example. And in general, various types of insurance contracts may benefit from including cyber risks (including household insurance, as with the launch of dedicated products by Mobilière or Bâloise). Do you need an expert appraisal to protect you from your cyber-security risks?